Even in the dead of winter and in spite of single-degree days, new Philadelphia restaurants have continued to blossom, and whether it's a coveted hole-in-the-wall or a lavishly renovated space, each a welcome reprieve from the drone of cold weather. Whether you crave handmade pasta or pizza with a cult following, upscale Indian fare or a boozy new brunch spot, Philly did not disappoint this season, reinventing familiar fare with refreshed concepts. As we start to see the first glimmers of spring, there’s no doubt some of these new restaurants will draw plenty of people out of hibernation. 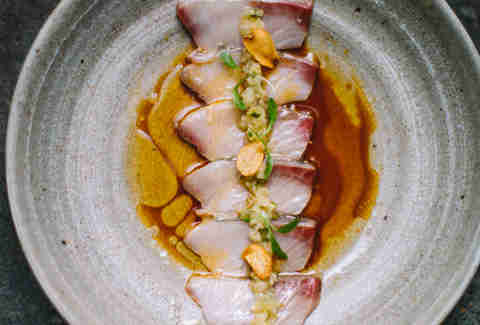 Check out the best new places from the last few months -- or skip down to Philly’s best restaurants overall, all outlined below. Taking a page from some of the city’s most popular restaurants, Fiore opened not only as a dinner destination, but as an all-day cafe open for breakfast and lunch, offering co-chef Justine MacNeil’s specialty sweet-and-savory pastries on a day menu focused on salads and sandwiches. The space emphasizes a more laid-back, casual setting, but is still upscale enough to bring in high-profile crowds for a dinner menu that includes pasta and veggie-focused dishes, plus MacNeil’s craveworthy gelato. The newly renovated space (previously home to Dos Rosas) is now continuing the legacy of chef Sanjoy Bank and restaurateur Shafi Gaffar, both of whom aim to create an upscale environment to serve Northern Indian cuisine. Halal meats, as well as non-traditional dishes utilizing lobster or other shellfish, are the menu highlights: go for the mango chicken, or the vindaloo. For dessert, expect fruit infusions for unlikely pairings (like the mango cheesecake). 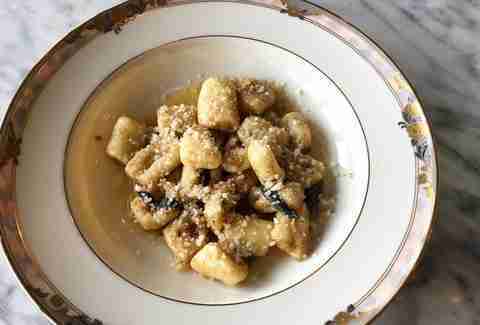 From the wreckage of Bridget Foy’s, the decades-old South Street mainstay that suffered a major fire in 2017, comes Cry Baby Pasta: an Italian concept from the Bridget Foy’s team while they continue renovating and repairing the famous space. The restaurant is serving made-from-scratch pasta and bread, including a small bruschetta menu and spaghetti for as low as $12. Reasonable prices run throughout the menu, but larger dishes, like the branzino with clams, will (surprise surprise) cost more. All pastas can also be made gluten free. It’s been a long time coming for Angelo’s Pizzeria, the long-awaited shop that traveled from its original Haddonfield location to the heart of South Philly’s Italian Market, inhabiting the old Sarcone’s Deli. 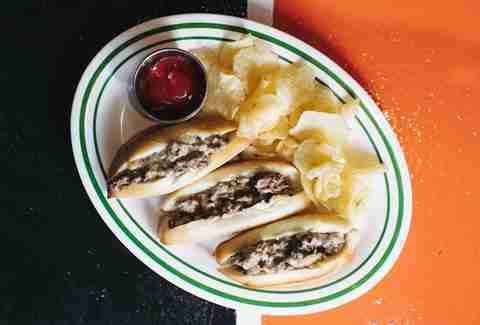 Since its January opening, Angelo’s has been serving thick square pizzas and cheesesteaks until inventory sells out for the day -- which typically happens earlier than later, so head there early to get a taste for yourself. 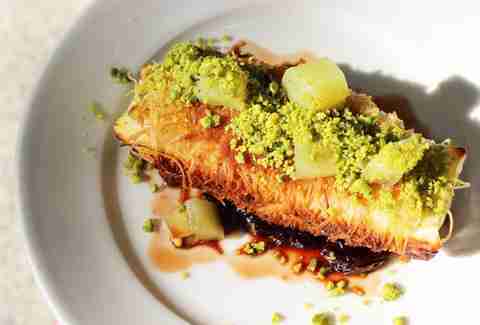 With just 16 seats right near the entrance of the Girard MFL stop on Front Street, Da-Wa has quickly become one of the most coveted foodie destinations in Fishtown, despite the no-thrills venue and pricier dishes. For $59, you can opt for the chef’s omakase menu (if you make an appointment beforehand), or go with ramen (including vegan options) and sides that include Korean dumplings and pork bao buns. If you need a one-stop destination to try some arcade games, play a card game over a pint of beer, finish a fluffy stack of pancakes, and listen to music, The Post is it. 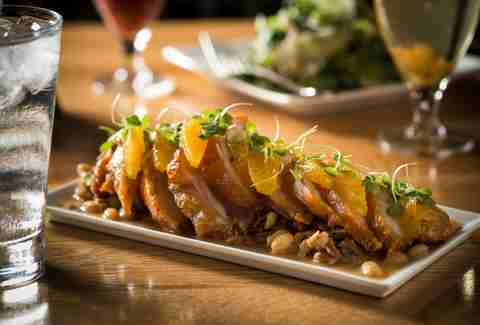 Located in the Cira Garage, the spot offers hearty comfort food and pub fare from Chef Richard Cusack, who previously created upscale French dining at Le Bec Fin and Parc. The beer hall offers plenty of local breweries on tap, plus a generous five-for-five happy hour deal and all-day cocktail menu. Ramen is on the rise in Philly, with another coveted shop selling out almost daily, this time in Queen Village. Neighborhood Ramen began as an Instagram-fodder pop-up, finally opening its permanent location in January to serve flavorful broths made from scratch. You can order your bowl with a selection of sides, including Japanese pickles and gyoza. Though the shop is still nailing down its full permanent menu, we can soon expect brunch items to show up at the shop, which is open from 11am to midnight on the weekends. Suraya is a newer addition to Philadelphia’s dining scene, and has quickly cemented a place among the city’s best restaurants just one year after opening. Though the space initially functioned solely as a daytime cafe and market, Suraya’s addition of dinner service in 2018 has made it the official staple of Fishtown dining. Stop by for some of the best Lebanese dishes made in the US, including kebabs, kibbeh, and definitely the lamb. 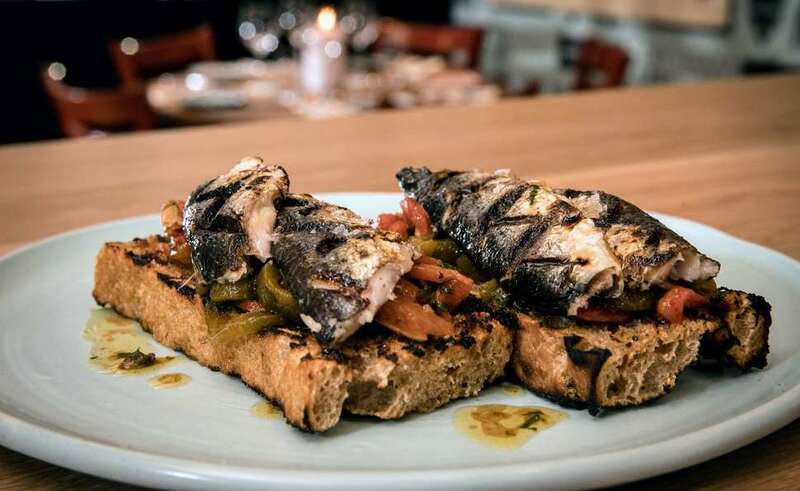 Palizzi Social Club, with a decades-long history, got a refresh in 2017 and quickly drew love from even the most particular eaters of Italian cuisine in Philly -- and the rest of the country. Dining there hasn't exactly been easy, especially since you need a legit card-carrying member with you to get a table; memberships have been sold out for more than a year, but the restaurant promises to sell more this spring. In the meantime, keep dreaming of all the red sauce you’re going to devour there. 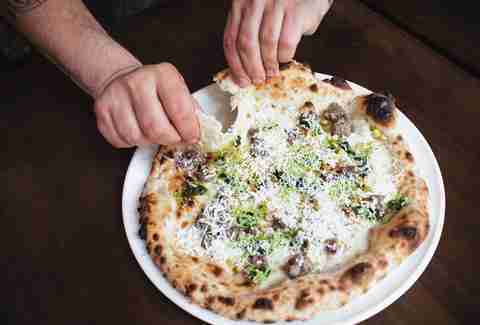 The pizza at Brigantessa is served in traditional Neapolitan style, meaning no pre-cut slices -- the kind of pizza that wants you to abandon all American habit and fork-and-knife your way along -- though your server will be happy to slice it up for you. The Regina pizza with Piennolo del Vesuvio is the must-have item, while gnocchi brushed with Calabrian chili oil is a must for lovers of all things hot and full of carbs. If you still think pizza bagels are exciting, elevate your tastes and head here for weekend brunch, where the drinks are bottomless and all pizzas can be breakfasty if you add an oozing egg. Double Knot is a dining destination for any time of day, opening at 7am to supply you with coffee, enduring the midday rush with build-your-own salad or rice bowls, and powering through into the evening to host a thriving bar scene. Walk past the bar, bookcases, and old mirrors, and enter the door in the back where you can enjoy an extravagant yet relatively affordable dinner menu ($55/person for a 10-course meal and dessert ain’t bad). 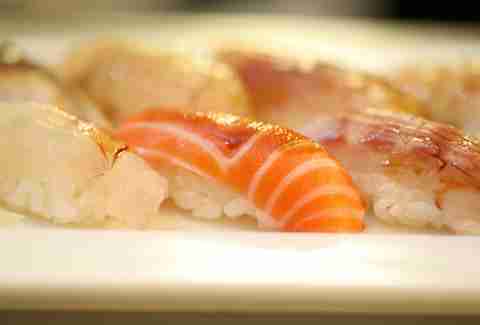 Sushi, robatayaki meats, and other Japanese izakaya fare are served in this hidden sushi bar with an underground feel. Whether you opt for the restaurant’s signature lamb shoulder or keep it simple with the best assortment of hummus you’ll ever find in Philly, any dish at this Israeli mainstay is enough to see why it's such a long-running institution. In the spirit of exclusivity, try to snag a seat at the chef’s counter for a more tailored experience. 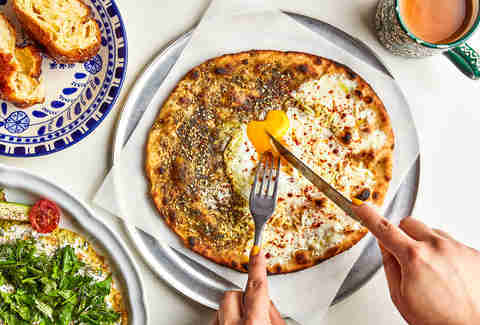 If you don’t have a chance to drop Zahav money right now (it ain't exactly cheap), try chef Michael Solomonov’s more casual Sansom Street concepts, including fast-casual Israeli spot Dizengoff, Jewish restaurant Abe Fisher, falafel staple Goldie, and the quintessential fried chicken and donuts shop Federal Donuts. This farm-to-table spot has a brunch menu extensive enough to compete with most lengthy dinner menus, and all can be ordered with a side of grits and caramel sea butter. For dinner, you get the chance to truly splurge on locally sourced cheese and charcuterie boards, seasonal salads, and pastas, including the escargot and farfalle bowtie pasta, and sides like bacon Brussels sprouts. The gorgeous, expansive space of Harp & Crown features high ceilings, exposed brick, a wrap-around bar, tufted booths, and vintage portraits. The striking atmosphere (and hidden basement bowling alley) can be enough to lure you inside, but the selection of stiff drinks, small plates, and diverse entrees will keep you coming back for more -- not to mention an all-you-can eat (and generous drink) weekend brunch. 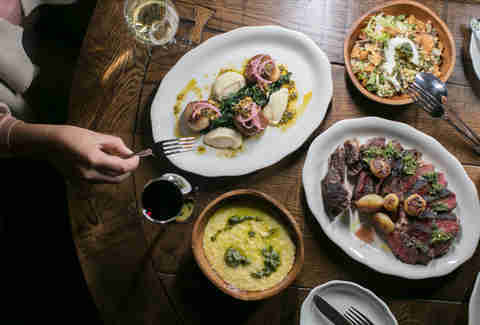 Charcuterie and cheese plates go great alongside Spanish octopus and lamb meatballs, while the hanger steak and the farro pasta with spinach pesto is one of the most satisfying meals you'll get to try. Chef Jose Garces’ very first Philadelphia restaurant opened back in 2005, and it doesn’t seem to be going anywhere anytime soon. The menu embraces Spanish cuisine, offering small, sharable tapas plates and an alluring tasting menu if you want to try a bit of everything. If you’re new to tapas, you can’t go wrong with gambas al ajillo (garlic shrimp), patatas bravas (spicy potatoes), or the lamb meatballs. Marielle Mondon is a writer from Philadelphia. Follow her on Twitter @MarielleMondon.